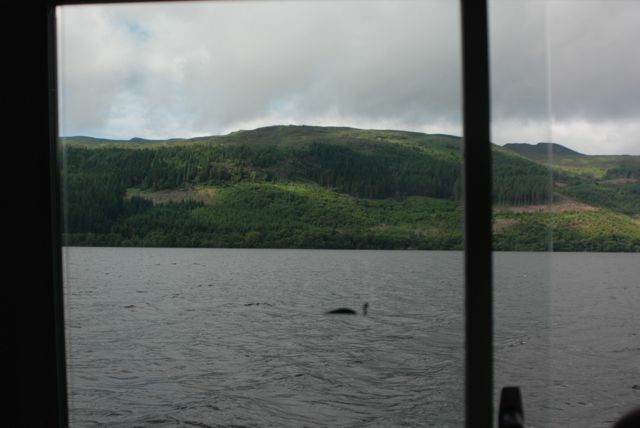 Thursday was our second tour with Heart of Scotland Tours, this time we were going north to see Loch Ness. To say I was excited about this would bean understatement. When Scotland was first proposed as a vacation destination my first thought was “I want to see Loch Ness.” Now, I know this isn’t anything real, but I don’t care. Just the idea of going there and seeing it for myself was intriguing! We knew where we were going this time, so it was easy to find our bus stop and meet up with our tour and Danny, our tour guide. Funnily enough, on our way to the stop, another tour bus honked at us, driven by our old friend James, who was leading a group on a four day whiskey tour. Our first stop of the day was the Deanston Distillery, where we had a wee tour of the distilling room and a stop for a coffee. Unfortunately, as we were there before 10am, we couldn’t taste (or even purchase) any of their spirits. Basically, they opened as a special favor to Heart of Scotland so we could see a working distillery without the crowds at other nearby places. It was a good first stop. It also marked the difference between our two tours. With the borderlands tour (#3 if you check out the website) it was a much more relaxed pace, with lots of time to see a few things. Here, we were on a tighter schedule since we were going to be putting about 400 miles on the clock and he had a longer list of sights. This was the #1 tour (literally and figuratively) for the company. It left every day of the year and I’ll wager it was always full up. 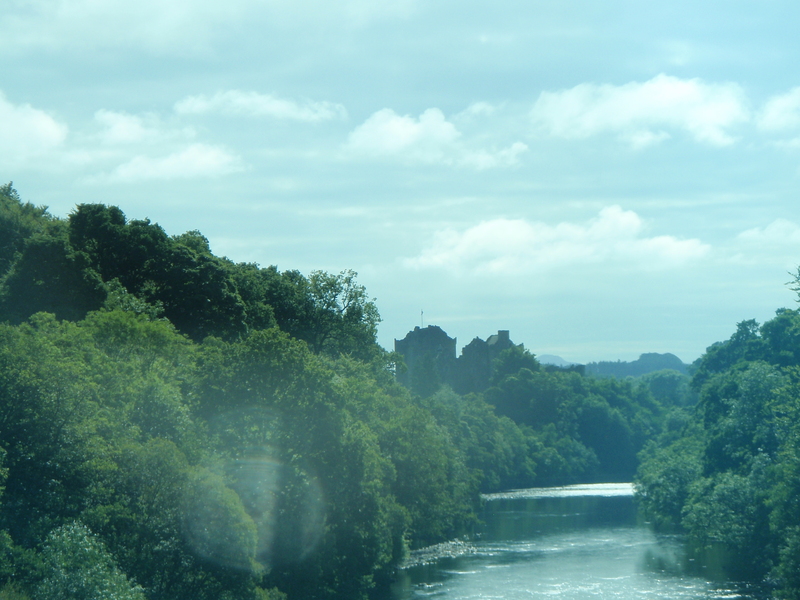 Leaving Deanston, we passed by Doun Castle, which has no historical importance… unless you’re a film buff and you learn they filmed Monty Python and The Holy Grail there. It’s also the site of Winterfell in the Game of Thrones TV series but hey, no need to split fandoms. On this tour, we only drove past it, but I would have loved to spend a few minutes seeing the place. As our tour progressed, it’s hard to describe the amazing scenery. As we switched from the low, rolling hills of the Lowlands into the sharper peaks and tree lined mountains of the Highlands, we started getting what Jennifer kept hoping for: Scottish weather. The sun disappeared and mist surrounded the peaks while rain threatened to ruin our run of perfectly good days. Even Danny, our guide, was a bit bubbly as he talked about getting to experience all the forms of terrain and atmosphere Scotland has to offer. We stopped to take pictures in an area of Glen Coe with three ridges known as the Three Sisters and then tried to catch a glimpse of the peak of Ben Nevis, the highest peak in the British Isles, coming in at a whopping 4,409 feet above sea level! The whole area is lovely. And familiar. Many, many films have used Glen Coe and the surrounding areas as locations, from the aforementioned Monty Python and the Holy Grail to the Harry Potter films and even the road out to James Bond’s family home (the home itself is located several hundred miles south, in England, but hey, that’s movie magic for you). Our other stop on the way up was at the Commando Monument. a statue and garden area set up to honor the Scottish soldiers and elite forces which have been fighting since being organized in WWII. Danny told us some great stories about heroic exploits and crazy training techniques which made me glad that wasn’t part of our tour. e fresh water in it than all the lakes in England and Wales combined. 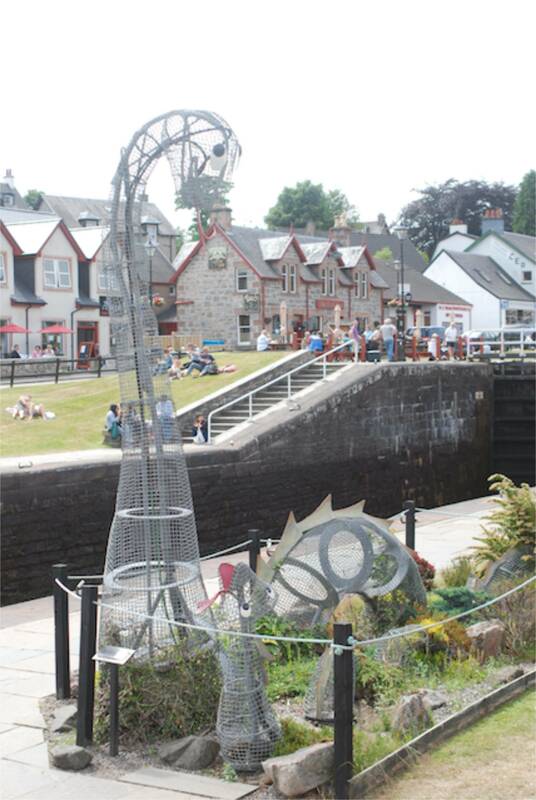 And yes, it’s home to the world famous Nessie. If I’d thought I’d only see Nessie up in the Highlands, I had that notion dispelled as soon as we’d arrived. I know I said previously that the official animal of Scotland is the Unicorn, but if you were to go solely by marketing practices, Nessie would win hands, feet and horn down. She (it?) is everywhere. 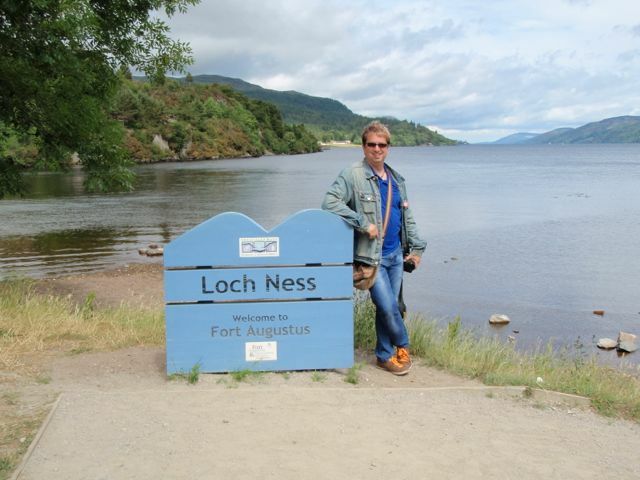 But as a purist tourist, the Nessie souvenirs I did buy, I bought there. that’s the whole point, right? though, with plenty of “experts” to talk to and a presentation on the sonar and fish finder technology. We also got a little look at something on the scanners which, if not the monster itself, is certainly a second cousin twice removed. It’s never been seen outside of the scan, but the scan has been independently verified as being something unknown and big lurking in the depths. While on the boat, I had the chance to talk to a young family from America and share a little bit of geekness with them. The daughter, who was 15, spotted my Ministry Of Magic shoulder bag and so started our conversation. I was able to give them some tips about where to go to see Potter related things back in Edinburgh, which was fun. Did I see a monster while I was out there? Look at the picture and you decide. Leaving the Loch, we had a long haul back to Edinburgh, but there were still a few stops left. One, where we were able to get some ice cream and stretch our legs, was called Pit Lochery and another village we passed was Killiecrankie, which really only gets a mention because hey, what a great name for a village! It seems like that would be an excuse for anything! We also saw the famous Highland Hairy Cow, which is an odd looking beast. We made it back to Edinburgh just ahead of our 8pm deadline and we headed back to the Hostel to pack and prepare for a short night. 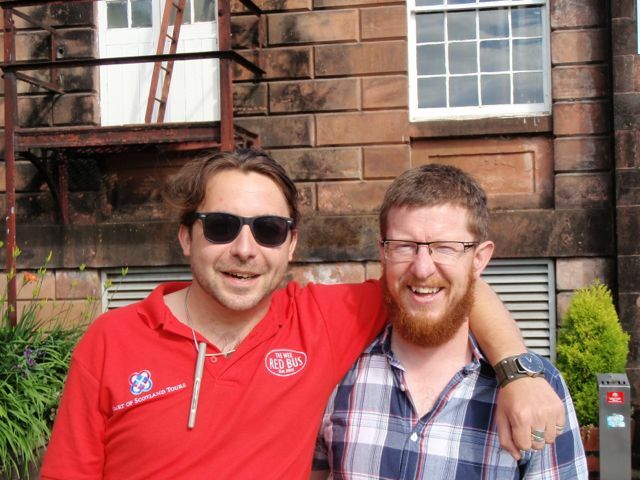 This was our last little bit in Scotland for tomorrow, we were off to Manchester.